“Which way is it?” P. shouted as he was cycling a few meters ahead of me. The path was rugged and dusty, with many puddles filled with the rain from the previous days. 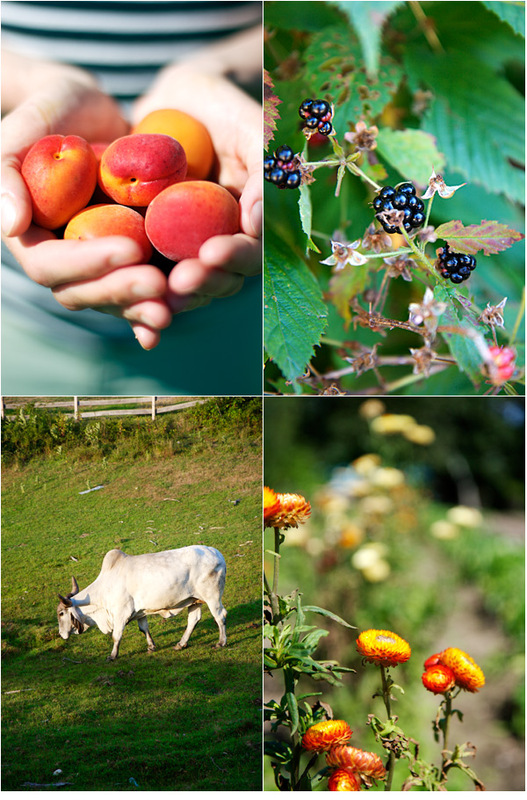 On each side, lines of black berry bushes were loaded with tempting fruit starting to ripen. 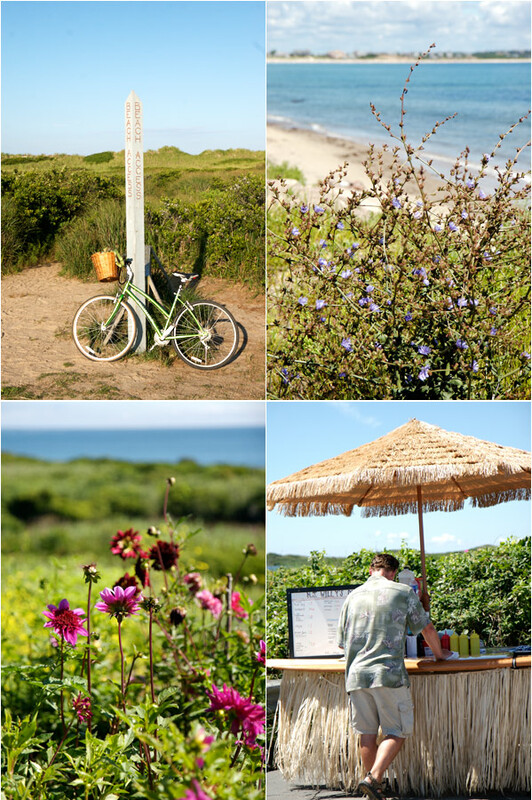 The path was also leading to one of the many lovely beaches that can be found on Block Island, actually one of our favorite beaches on this small island off the coast of Rhode Island. 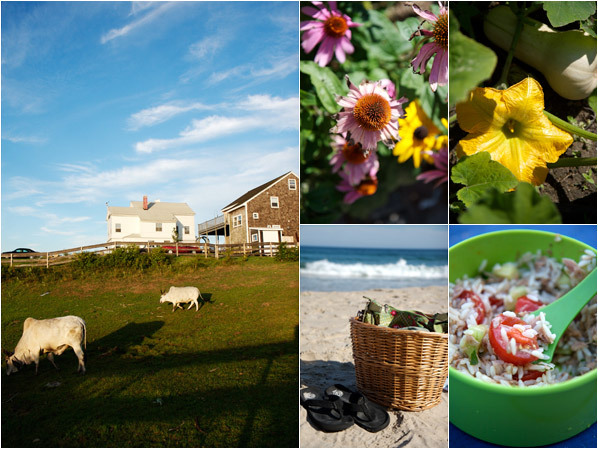 This past weekend, we decided to go back to Block island for the second time, after the great trip we’d had there last summer. It was a weekend getaway that we had been looking forward to for a while. So good that it was finally here. “You brought the sun with you!” smiling Gaby told us when we arrived at Sea Breeze Inn where we were going to stay once again. She gave us a warm welcome that made us feel we were in fact going home. “You bet!” I replied, bursting into a loud laughter. In fact, it was quite a relief since the weather forecast had not been too promising. Cycling in the rain would have been a different experience. It was really nice to see Gaby again, and find this familiar place where we had relaxed and enjoyed warm sunsets last summer. Our program for the weekend was going to be quite similar in fact to last year’s: cycle, relax, rest, pack nice picnics and in short, take it as we please and as it comes. Since I remembered there was no cooking facilities at the B&B, I planned accordingly and improvised — despite the fact that we traveled on our bikes all along, leaving the car in Point Judith, where we took the ferry: I packed a vegetable peeler and grater, my picnic container, a small glass jar with a homemade vinaigrette so that I could prepare salads. During our stay, we lunched on simple foods and at night, we dined out. 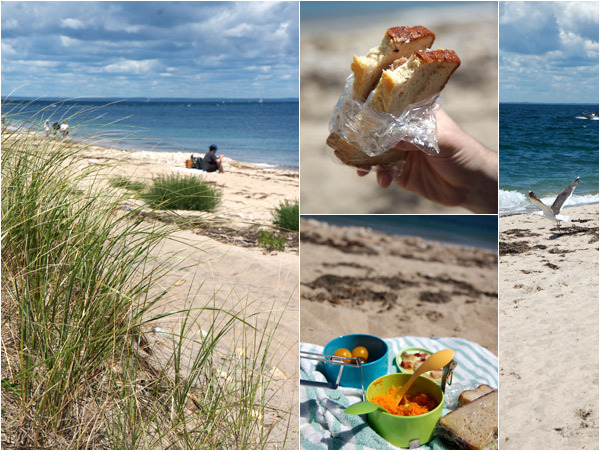 We picnicked on tuna, cucumber and fresh goat cheese sandwiches, with cherry tomatoes and vegetable chips. We ate a carrot salad one day, and a rice salad another day. Since I had also prepared a batch of my chocolate and nut cookies, we enjoyed those as a simple snack, and always had apricots, cherries and roasted nuts to nibble on when we felt like it. When we were not cycling, we would stop to find a nice quiet spot on a beach where we napped until we felt too warm, eager to get a shady spot. When we sat in the back porch of the B&B, we read books — well, P. did while I was reading cooking-related articles and sketching a few recipes on a notebook. We did not have either a computer or access to our email, so much so that it really felt like a real mini-vacation! “Shall we have a row now?” P. asked enthusiastically on the last afternoon, after we returned from the beach. I was feeling quite tired by then but I also knew that he had been dying to use the kayak available on the B&B’s premises since he first saw it. The pond was still and peaceful in comparison to the constant ocean surf, and we were surprised to find plenty of life in the water. “We should really nickname this pond turtle pond,” I told P. jokingly at the sight of the small turtles we saw swimming everywhere. They would poke their tiny heads above the surface and stay still, almost suspended in the air, before quickly diving under when they saw us approach. I wished I could have been fast enough to take a snapshot, but they were simply too smart! 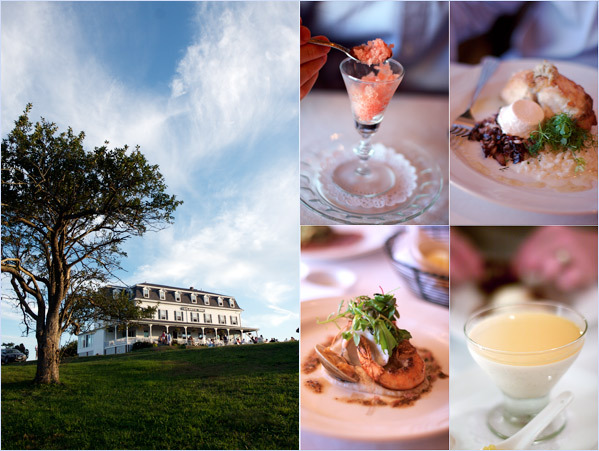 One night, we ate at Atlantic Inn. The food was as delicious as we remembered from the dinner we’d enjoyed there the year before, with a definite Asian flair to a more classic new American cuisine. We dined on fresh seafood — scallops, clams, monkfish cooked on the bone and served with different types of flavored rice, sunchoke puree and roasted raddichio. We also sampled a blueberry guacamole served with thin slices of smoked duck that truly picked our curiosity. Dinner at hotel Manisses, on the other hand, was a total disappointment: poor service and a food that lacked character, beside perhaps for the roasted pumpkin soup with lobster cream which we ate to start our meal. We were sure to not go back. On our last night, we followed Gaby’s recommendation and dined at Eli’s where we savored surprisingly flavorful and fresh food. I particularly enjoyed the fried blend of white and wild coconut rice served with fresh summer corn, mushrooms and kale that accompanied my herb-grilled mahi-mahi. P.’s dish, pasta cooked with artichokes, lobster and crab meat in a creamy sauce, was equally appetizing. The small restaurant room filled up quickly and we were glad to have arrived early, to avoid long waits — the place does not accept reservations. This time, we promised to go back. “Did you see the lightning last night?” I asked P. when we started to pack our bags on Monday morning. It was so strong that it actually woke me up. So yes, it happened: the excepted rain and thunderstorm finally arrived. Gaby mentioned a few strong thunderstorms that had occurred earlier in the month causing noticeable damage to some house roofs hit by lightning around the island. I was glad we missed it and that instead, we enjoyed great weather during the entire weekend. “I will miss you guys,” Gaby said when she saw us busy loading up our bikes as we were ready to leave. Thirty minutes after getting on the ferry, we were already back in Point Judith. One hour and a half later, we would be back home. “What shall we eat for dinner?” I asked P. when we got into the car. In fact, all I could think of was the pot of corn soup we had enjoyed the day before we left. “Corn soup for dinner, ça te dit ?” I asked P.
“Mmmmmmmmmmmmmmmmm.” He really liked this one. I cooked the soup with a few fresh local ears of young corn picked at the store on the way back, celery and a young head of celeriac with its greens still attached, and served the soup warm with on top, diced cherry tomatoes , fresh purple basil from the garden, and thin sole fillets lightly cooked and cut in small pieces. Not typical I must say, but we really loved this plat complet (one meal dish) as it was. And the next day, I served the leftovers with fine fresh goat cheese from Vermont crumbled on top. You must agree, corn in summer is really something special, non ? And so is Block Island. Cut the kernels off the ears; reserve. In a large pot, add the milk and corn ears, and bring to a boil. Stop the heat and let infuse covered for 15 minutes. In the meantime, heat 2 Tbsp olive oil in a thick-bottomed pot and when hot, add the onion and thyme. Let cook, without browning, for 3 minutes. Add the garlic and continue to cook for 1 minute. Add the celery branch, carrot, celeriac with its greens, and the bay leaf. Let cook for 5 minutes. Add the corn kernels — reserve about 2/3 cup that you boil for 1 minute in salted water — and 1.5 cups water, the milk and corn ears. Bring to a simmer and cook, covered, for 15 minutes, or until all the vegetables are fork-tender. Remove the thyme, bay leaf and corn ears, and mix your soup — check the texture of the soup and if too thick, add more water. Season to taste. Serve warm in bowls with the diced tomatoes, the extra corn kernels, fresh parsley and basil. Finish with a dash of paprika. Prélevez les grains de maïs des épis et mettez-les de côté. Dans une marmite, mettez le lait avec les épis et amenez à ébullition. Arrêtez le feu, couvrez et laissez infuser pendant 15 minutes. Pendant ce temps, faites chauffer 2 càs d’huile d’olive dans une cocotte et une fois l’huile chaude, ajoutez l’oignon et le thym. Faites cuire sans brunir pendant 3 minutes. Ajoutez les dés de céleri branche, carottes et céleri. Ajoutez les feuilles de céleri et la feuille de laurier. Faites suer pendant 5 minutes. Ajoutez enfin les grains de maïs — mettez environ 100 g de côté et faites-les cuire dans de l’eau bouillante salée pendant 1 minute — et ajoutez l’eau, le lait et les épis de maïs. Faites mijoter sur feu doux à moyen, à couvert, pendant 15 minutes. Enlevez le thyme, la feuille de laurier et les épis de maïs, et mixez votre soupe — ajoutez plus d’eau si nécessaire, selon la consistance de la soupe. Assaisonnez de sel et poivre, selon goût. Servez la soupe chaude dans de grands bols, et garnissez de tomates, du reste de grains de maïs, de persil et de basilic. Finissez par un soupçon de paprika. That is one heck of a weekend getaway! And yum on the soup…says the girl eating a bowl of sauted corn as she types. A glorious getaway by the sea! I’ heading to the other coast with my family this coming weekend. A good way to finish up the summer. Great photos, as usual! Such a beautiful and peaceful place! Your soup looks divine! 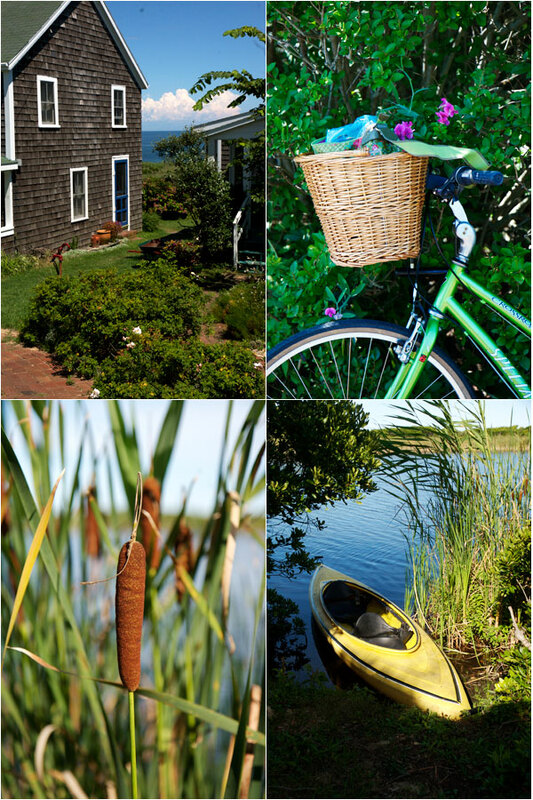 what a great getaway and your photos are so beautiful! Another wonderful cycling weekend. How delightful. Your post (and soup) were very warming. Thank you for sharing it with us. I love corn soup! This looks utterly delicious! And what a weekend. 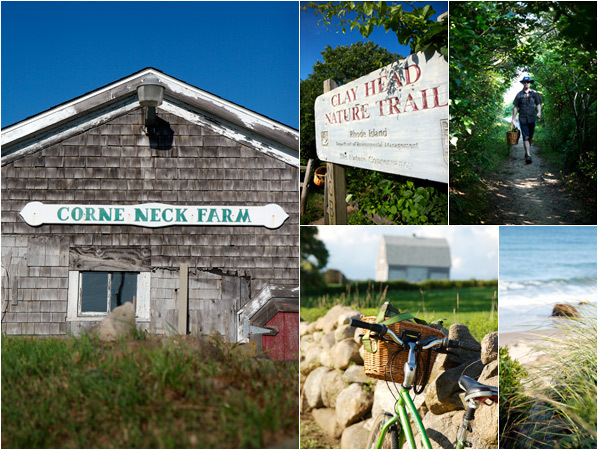 Your photos make me yearn for the east coast! Qu’est-ce que tu veux que je te dise? Tu m’avais deja fait rever l’an dernier, avec ces images lumineuses d’un ete parfait. Ces photos respirent le bonheur. What a great weekend! I just dig your bicycle so much!! And the corn soup of course! I just made a fresh pea one. Keep forgetting to tell you that I made the rice noodle soup you posted a few days ago and we can’t get enough of it!! Wow, what a gorgeous trip! I just love your blog! Beautiful photographs- it is lovely there! what a stunning weekend. 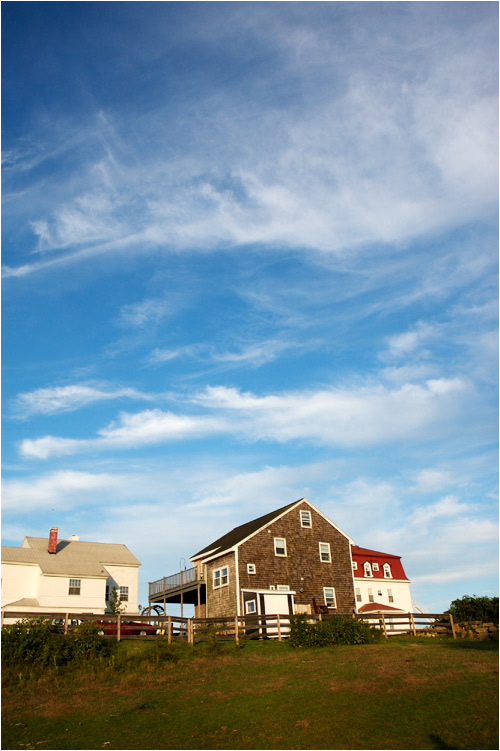 We had a family wedding on Block Island a few years back; the setting was stunning. Your soup looks equally-beautiful and must have fit in perfectly with the surroundings. Gorgeous. Fantastic pics, great soup!! Fabulous week end! just like the freshness of the ingredients you choose. I’ll be back. I love the pictures and I love soup! Your photographs are stunning. 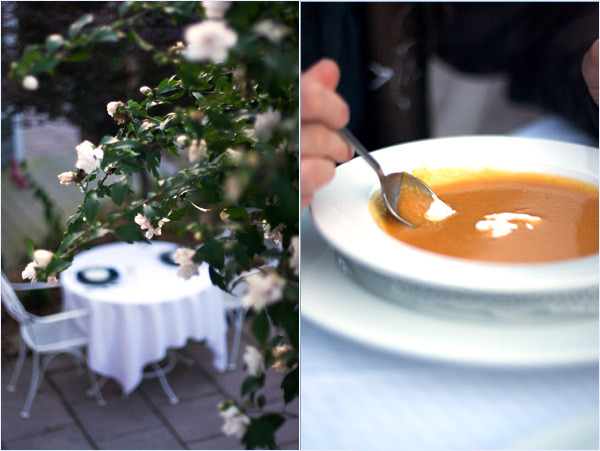 The corn soup photo could possibly be my favorite blog photo of all time! Just found you on tastespotting. Really enjoying your post. I adore Block Island. When we were teenagers, my best friend and I spent almost every summer weekend roaming the island. I miss it very much, it’s the kind of place that just draws you back again and again. Thanks for the beautiful pictures that stirred up so many memories! I have been a fan of your blog for a while, and have tried some of the recipes with great success! Thank you so much for sharing your talents!! Superbes photos comme toujours – merci ! a blueberry guacamole ….?? peux tu m’en dire plus ! bien qu’ayant tjs eu envie de manger une soupe de maïs, je n’ai jamais goûté ; en un sens, elle représente la cuisine américaine traditionnelle pour moi, bon, je note la tienne pour l’automne prochain ! This looks like a great comfort food! 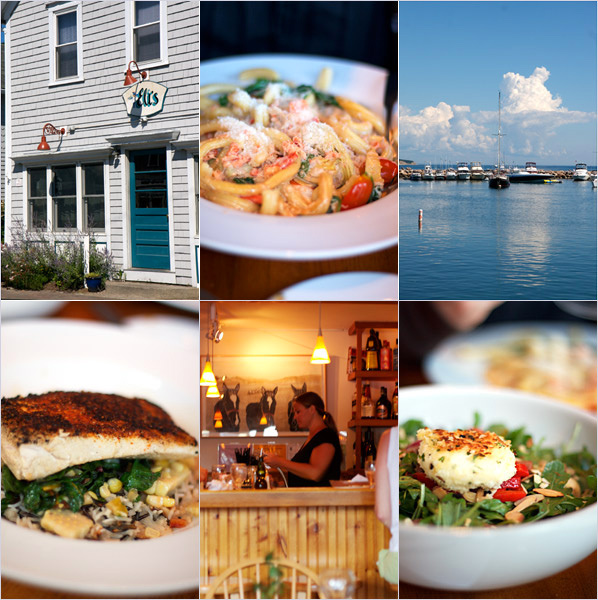 what great place and beautiful photos as well….. will try your soup again. i love your little getaways.. wish I live where you live.. and you always come up with healthy but delicious eats! Such a lovely getaway! 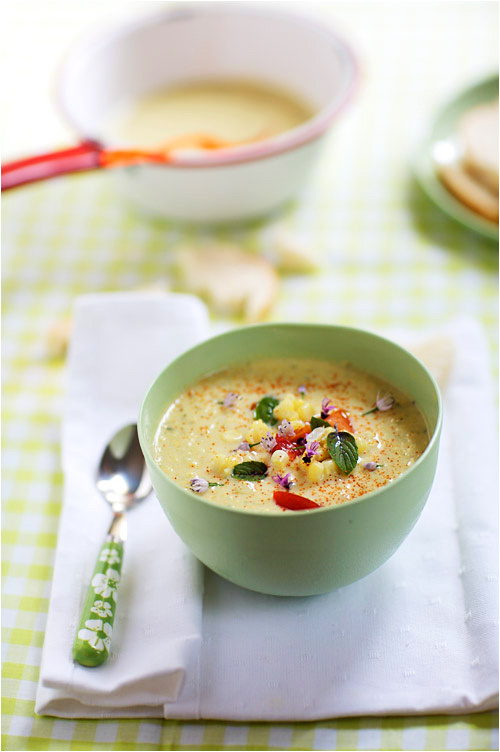 And your photo of the corn soup is so beautiful and summery! I loved this post. I live in Providence (although am not from here). 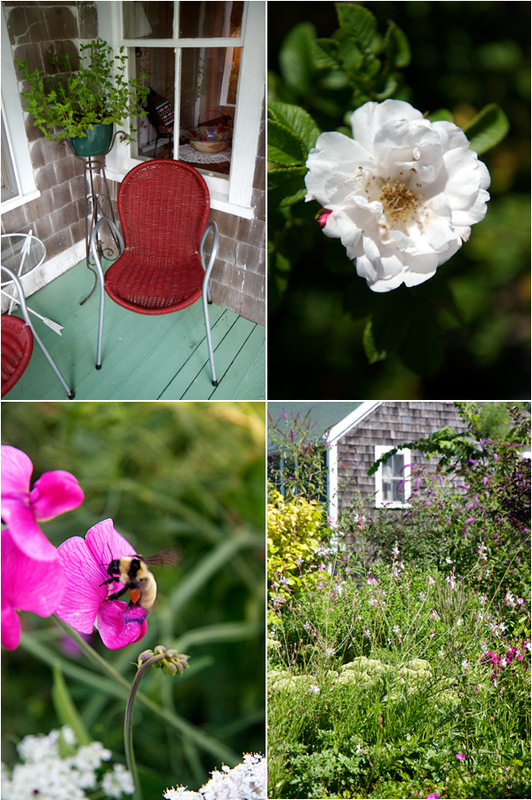 Just went to Block Island for a day recently….your post captured the slow pace and bright colors! I’ve never made corn chowder and am thrilled to have this recipe. I’m starting to get fresh corn in my weekly CSA box, so I’ll try your chowder. Lovely photos, as always! 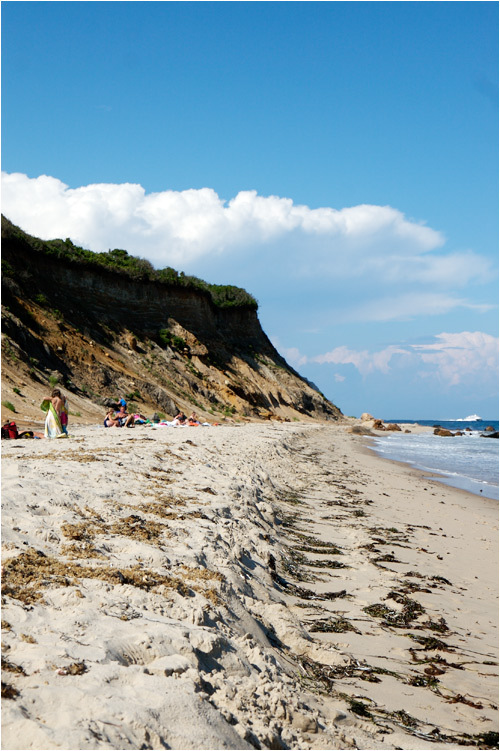 I frequent Misquamicut Beach in RI, which faces Block Island. I love the New England specialties. I think Lobster is just amazing, when it is fresh. I eat in one day, then the next day: lobster rolls and lobster bisque. There is something truly incredible about thew New England coast line. And you wonder, how did they make all their cottages so cute. Thank you everyone, very much!! Merci à tous ! Tes photos sont toujours très jolies: de la lumière, des couleurs et de l’évasion. De quoi bien commencer la journée! As summer comes to an end, corn recipes are popping up all over the place! Your soup and photos look phenomenal, as always, and over here at Kitchen Caravan we too did a spotlight on corn not too long ago! Sophia made a stew and some corn fritters, as well as an Eastern European dish called Mamaliga. Feel free to drop by and see what other delicious recipes you can make with corn! I have had the pleasure of finding your blog and am delighted by every post; all your colors, pictures, recipes and presentations are artistic and beautiful to look at. 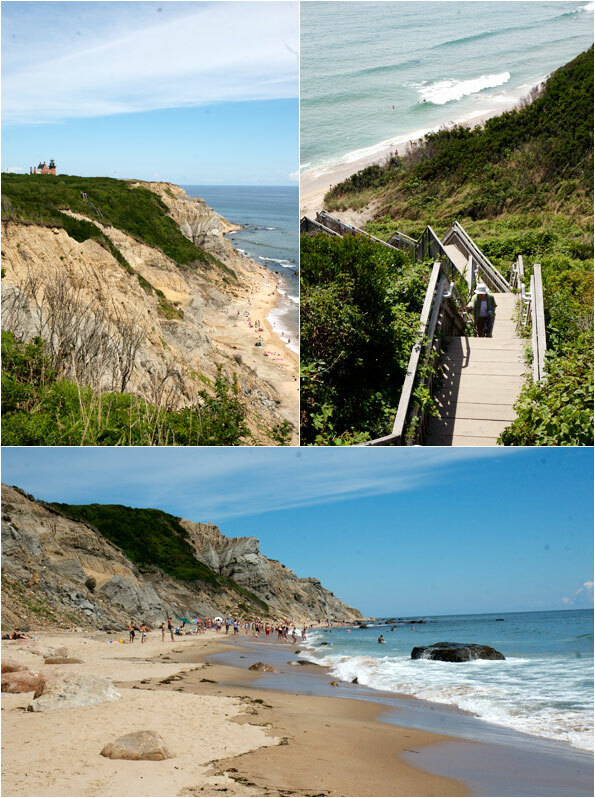 I was especially excited you posted about Block Island, as I am planning a trip there for mid September with my husband! Having never been myself, I will take some of your suggestions. This was kismit! Also curious, what kind of camera do you use? Digital I presume? I look forward to more from you & thank you for being so fantastique! Thank you everyone. Anastasia, thanks for the suggestions. This is exciting to hear you will visit Block Island. I hope you enjoy it as much as we did. Also yes, camera is digital, a Canon 5D, although the pictures here were taken with a Canon 30D (my travel camera). i don’t care if it has no nutritional value at all, i love corn and this soup sounds fabulous! and of course, gorgeous photos as always. love the big skies. What stunning photos, and such an idyllic sounding island. One day I shall visit!! je trouve pas les mots pour dire combien tes photos sont belles…les “food”donnent l’eau à la bouche, et les “travel and life” donnent envie de voyager, de passer des moments pleins de simplicité et de bonheur…j’aimerai pouvoir faire le même genre d’image pour illustrer mon blog…bravo! I located your blog recently when I was searching the internet for recipes using celery, as I have so much left over from Christmas. I’m looking forward to making the Young Corn and Celery Soup! I will be making it in a day or so. It sounds wonderful! Your pictures are beautiful as well! Thank you for sharing!